You are here: Home / Uncategorized / Sell Croatian Diplomatic And Consular Missions? No Deal! Sell Croatian Diplomatic And Consular Missions? No Deal! One week – it’s on, one week – it’s off! One week we hear that the Croatian government is planning to close some of Croatia’s consular missions in Australia (and elsewhere) and then one week we hear that this is not the case! Certainly, there has been enough in Croatian media over past decade or so suggesting that plans of closures are indeed afoot, if for no other reason then to save money! Such “rumours” as well as statements from left-wing political camp foreign ministers started with Tonino Picula in 2000, lingered, and seem now amplified by Vesna Pusic. While purposeful moves to distance the diaspora from its homeland do not surprise one, as they originate from those who did not want Croatian independence in the first place, it is up to the diaspora to fight against these destructive moves. Particularly in countries such as Australia, Canada, New Zealand, South American countries, US – the more distant ones. Since Croatia is a EU member state one can argue that too many diplomatic missions are not necessary across it (?). Well if the incompetent government wants to save money on operations that are a lifeline to the homeland for its large body of émigrés then, I guess, it has the mandate to do it. However, the Croatian government must know that most of the properties where the diplomatic and consular missions are established in the “Western” world were actually purchased through dedicated, specific, purposeful charitable fundraising and if the government cannot operate them as intended and promised then it is only reasonable to demand that these properties be handed over to the Croatian communities who donated the funds for their purchase and such properties be utilised for other uses the donor Croatian community needs. I would hate to see the government selling these valuable properties and pocketing the proceeds from the sale to plug holes in the state budget they brought to the brink of bankruptcy through incompetence. Having achieved widespread international recognition as an independent country by February 1992 the time came for Croatia to establish its own diplomatic and consular missions across the world, Serbs took hold of the properties where the embassy and consulates of Yugoslavia had been as if they were their own! So, “penniless” and still defending itself in the war of Serb aggression, Croatia had no adequate financial means to set up its diplomatic and consular missions abroad. In came the initiative from the diaspora to set up special-purpose Funds that would raise charitable funds among émigrés, which would be used for the sole purpose of purchasing properties that would house Croatian embassies and consulates. As the laws in “Western” countries where Croats fundraised dictate, charitable funds and assets must only be used in furtherance of the purposes the funds were raised. And so, by the end of 1992 to about March 1993 Croats across the world raised enough funds to purchase the needed properties and equip the diplomatic and consular missions with all and necessary equipment and tools needed. In Australia the results were as amazing as everywhere else in the world. Australian Croats had purchased valuable properties in Sydney, Melbourne and Perth for consular offices and in Canberra they commenced building a grand building that would house the Croatian Embassy. With great satisfaction, I have received the information that you wish to collect charitable funds with view to giving Croatia the buildings for diplomatic and consular missions in Australia. As the president of all Croats, I support and highly respect the intention that the fundraising action for this purpose be all-Croatian and that it gathers together as many of our émigrés as possible, regardless of political or other association. At the same time, I would like to inform you of my intention and my great wish to, if at all possible, visit Australia for the occasion of the opening of the Embassy of the Republic of Croatia in Australia. 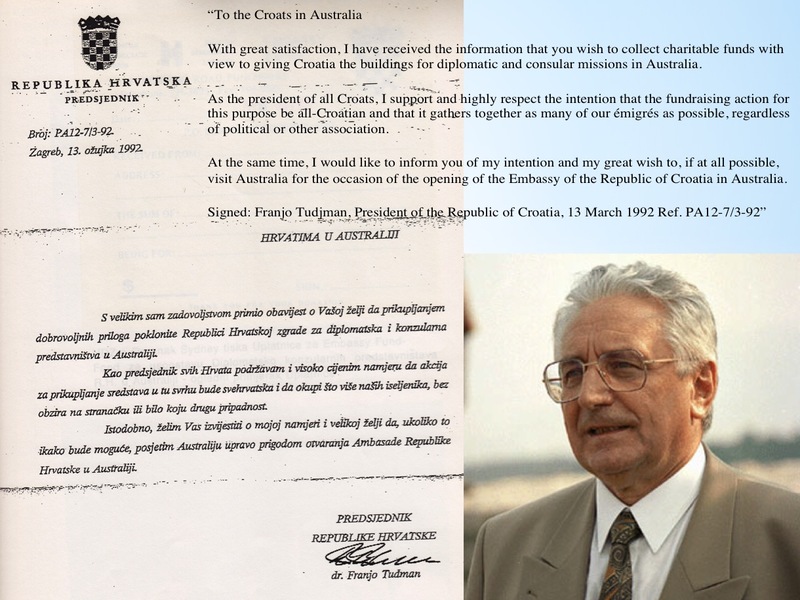 Signed: Franjo Tudjman, President of the Republic of Croatia, 13 March 1992 Ref. PA12-7/3-92”. In just over twenty years of Croatian diplomatic and consular missions in operations across Australia, Canada, New Zealand, US, South America…there has been very little achieved in that “gathering” of diaspora Croats towards a better, stronger and optimally fruitful and dynamic connection with the homeland. If anything, since the death of Franjo Tudjman in 1999, the close and benevolent connection that existed then, and had the potential of significant contribution towards building a full democracy in Croatia, targeting in particular issues associated with transition from communism, had been systematically eroded. Purposefully perhaps? And so, having been centrally and significantly involved in the early 1990’s fundraising drives for the establishment of Croatian diplomatic and consular missions in Australia, I sit here and ponder, with an uneasy and heavy heart. Should we allow an incompetent government in Croatia tear apart that which the community secured with charitable funds? Should we keep quiet until it’s too late and the properties we purchased for specific purposes, with charitably donated funds – are sold off by the government? I think not! But if the government sells the properties anyway, then it should be stopped in squandering the money from the proceeds of sale in plugging budgetary holes. The properties or the proceeds of sale should remain in the function for which they were purchased and if that is not possible then their function must remain in the greater use and benefit of the diaspora community, which donated the funds to establish them. Certainly, there are ample records kept of the history of the sources of funding for ‘the bricks and mortar’ and how these diplomatic and consular missions were established. “When injustice becomes law, resistance becomes duty” said one of the American founding fathers Thomas Jefferson long ago. They can close down their offices in Australia, but the properties have to go back to the communities that bought these commercial properties. It’s easy to sell someting that you didn’t earn or work for. But these politicians have been doing this for too long, selling state owned companies to themselves for next to nothing. We in Australia are not that stupid. From Facebook: This is why we need to get rid of the communist mentality that is still occupying office of the government. It is really sad that they want to sell these buildings for short term gain when they can be used for better purposes for its on people.I think the best thing to do is to make this a political issue before the next election and to protect our interest over governments attitude that everything is for sale. I think the diaspora needs to set up a Political Action Committee. you know the government is afraid of the diaspora for many reasons and anything they can do to stop or slow us down they will. I’m in there right with you, Steve, more people from community will be needed if we sniff out a sale – there’s plenty of stored and archived evidence as to the dedicated fundraising etc at the time. What matters more than in whose name the properties are registered, Marija, is how and for what purpose they were purchased, Marija.There are ways in the west to protect the interests of properties purchesed with charitable funds for specific purposes and while the government might be able to do what it likes in Croatia, abroad it’s a different kettle of fish and I’m certain the Croatian community will know how to protect its interests. That’s the spirit, Beba. Thank you and yes it’s so good to be reassured many witnesses to the charitable and benevolent work are still there. What to do but selling all that our people paid for – there is no more generous donations from diaspora….What a gangster government!!! That government shall not be watching that movie (sale of our properties) – that’s for sure. It never ceases to amaze how incredibly incompetent and arrogant this government under the mismanaged, misguided, visionless, anti Croatian, yugonostalgic and leadership deprived Milanovic is. Ina, rebel and fight these idiots! Hi Barbara, the matter of dividing the land of former Yugoslavia between the former states is not an issue in most part as former Yugoslav states have become independent and each had within Yugoslavia their internationally recognised sovereign borders, however Serbia and Serbs did want to steal pieces of Croatia and Bosnia and Herzegovina – hence the 1990’s brutal war of aggression and ethnic cleansing of non-Serbs from areas Serbs had occupied. They did not succeed in Croatia but in Bosnia they keep hold of the so-called newly created Serbian Republic entity over which Serbs hold authority and some autonomy even though it’s still within the sovereign borders of Bosnia and Herzegovina. As to property/assets abroad that was amassed by Yugoslavia (i.e. federation of the former Yugoslav states where each contributed to the budget and purchase of those properties, usually diplomatic and consular missions and diplomatic residences etc as well as bank accounts held abroad by former Yugoslavia) the process of dividing that property between the states has been very slow and at times impossible. However some progress has been made and through arbitration etc former states are gradually getting what is owed them, but Serbia had “occupied” those properties too after the states of Croatia, Slovenia, Bosnia and Herzegovina, Macedonia seceded from Yugoslavia – Serbia kept their personnel and control of those properties as prior to the breakup of Yugoslavia it was mostly Serbs who worked in Yugoslav diplomatic missions etc! So Croatia, even though it contributed economically relatively the most to Yugoslav federation was left with nothing of this, it had to purchase/establish new ways of housing diplomatic missions etc – that the properties this article of mine speaks of/they are not associated with former Yugoslavia. Bank accounts of former Yugoslavia abroad (e.g. Paris, New York) were frozen in late 1990’s and slowly only in the past couple of years have the funds been considered for distribution among former Yugoslav states but as you can imagine that’s not going to make anyone a “millionaire” as funds are not huge – it’s the properties owned by former Yugoslavia that are valuable and this process of division is still painstakingly slow, sadly. Seems like the properties really belong to the community. But who holds the title deeds? Laws in Australia and other “Western” countries are quite clear on that and proof of purchase, funds and fundraising etc is usually enough to set things right as far as charitable fund donors are concerned. What’s up everyone, it’s my first visit at this web site, and post is truly fruitful in favor of me, keep up posting these posts.